You Can Put THAT In the Dishwasher? Be amazed, yes, you CAN put that into the dishwasher! Here are 20 things to wash in your dishwasher. We love house hacks and these are perfect for deep cleaning your home – with less elbow grease and effort! These neglected attachments can become dusty. Bring new life to them. Stick them in the top rack – and if you have a temperature setting turn it down. If your vacuum attachments are like mine they have rubber gaskets and stuff in them that don’t like high heat. Did you know that door knobs are one of the germiest places in your house? Cut the germ load down in your home. After illness or with your yearly spring cleaning, dissemble your door knobs and stick them into your dishwasher. 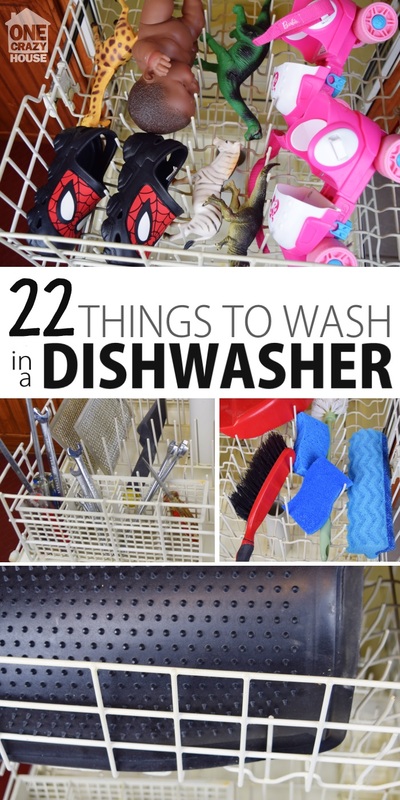 If you have a large dishwasher (or small windows) you will love this nifty hack! You won’t believe how much dust and debris is in your screens until you’ve washed them. Totally cool! 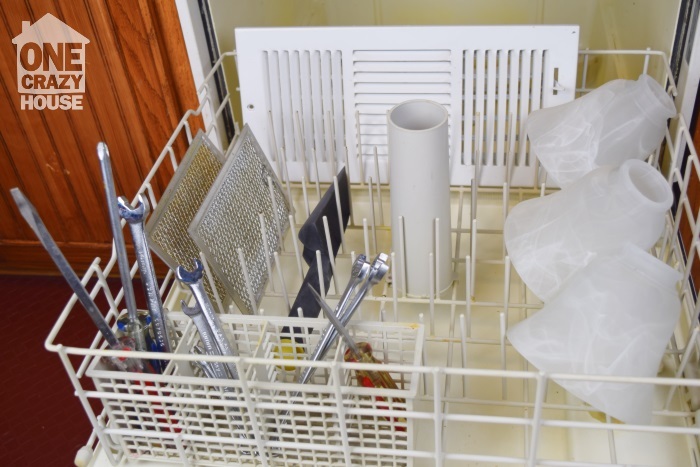 You can put a wide variety of vents into the dishwasher! If you have air duct grates, unscrew those and throw them in, the metal grates in the range hood are also easily cleaned with the pots and pans cycle. You can even remove the air vents in your car (if your car has removable vents) and stick them onto the top rack. No more grungy grates! The trash can lids often become grubby. At least weekly, assuming your lid fits into your dish washer, wash your lid with hot water. Your trash can will thank you. With your spring cleaning don’t forget your light fixtures. Unscrew them from your lights and put them into the dishwasher. The lights will be clean and brighter! After gardening your tools can be caked with mud and other grit. Instead of cleaning them by hand, stick them into the dishwasher on a quick cycle. You can even do this with wrenches and screw drivers. Just be sure to dry them off whenever the cycle is over so they do not rust. Especially if your house has had a bout of illness, keep your kids from reinfecting themselves by washing the things that your kids came into contact with while they were sick – i.e. their toys! Stick their plastic toys into the washer for a quick wash. If they are small parts, like lego pieces, consider putting them into a mesh bag on the top rack before washing. Your hair brushes (not natural bristle ones or ones with wood) will benefit from a wash. We stick ours upright in the silverware caddy. This is an especially good tip to file away in case your kids get lice! Living in a warm climate almost all of the shoes at our house are plastic/rubber flip flops, croc-knock-offs or sandals. We regularly wash our shoes in the top rack of our dishwasher – even the occasional sneaker has benefited from a quick wash. Does your kiddo’s sport bag smell a bit like dirty feet? Sports gear like shin guards, sparring equipment, helmets, and more can all be washed on the toprack of your dishwasher. The hot water will disinfect your kids gear. We suggest not using dish detergent, but rather use a single drop of dish soap and a tablespoon of baking soda. This will get rid of the sweaty grime without harming your gear. Just Genius! Seriously. 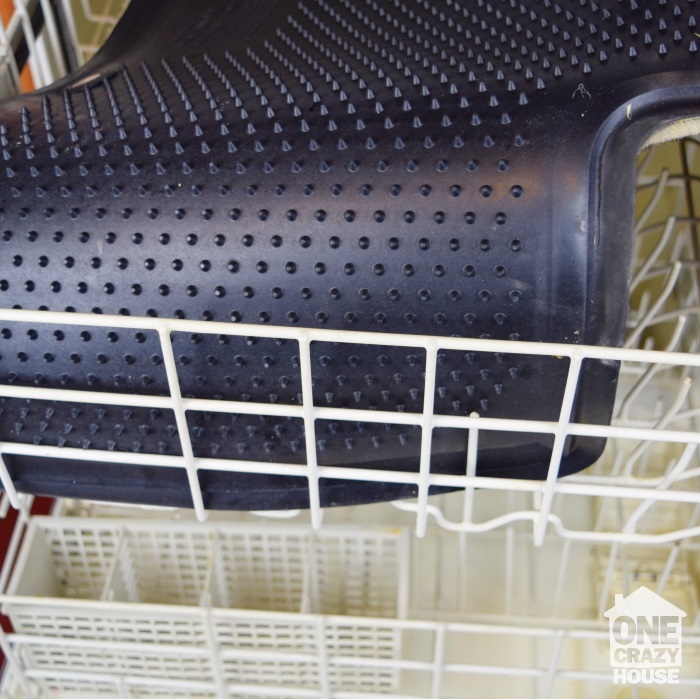 Bang the gunk off of your car mats and then lay them over the top rack of your dishwasher. It’s a pressure wash that requires no elbow action on your part! You will love the finished product! A car detailer told me this was the secret to sparkly hub caps. Remove the caps and stick them into the wash with a hot water cycle. You can use a streak free additive if your hub caps have a glossy finish. They will come out looking like new! If your dust pan is like ours it is constantly collecting bits of trash and with all the fibers it is the perfect dark place for bacteria to breed. Clean your dustpan and dust broom in the dishwasher. Put them on the top rack – the fibers don’t like heat, so if you are able to adjust the temperature, turn it down. If your mop has removable heads, stick it into the dishwasher for a quick cycle. You can put them on the top shelf. The agitator is great at bringing new life to old cleaning tools. 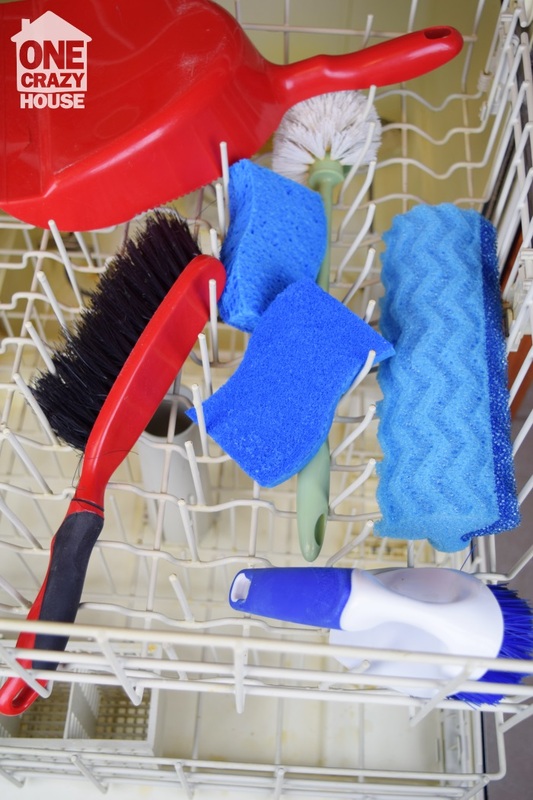 After you are finished hand-washing your pots and pans or other non-dishwasher safe dishes, stick the dish scrubbie into your dishwasher on the top rack. The hot water and soap will kill off any bacteria left behind. Your scrubbie will smell fresh a lot longer with this hack. Did you finish scrubbing grout? The tub? Throw your scrub brush into the dishwasher. This will prevent mold from growing in your brush and limit the soap build up in the brushes. Your toothbrushes should be regularly cleaned. You can do that by storing them upside down in Listerine or the equivalent for an hour or so – OR stick them into the washer. We just put ours in the silverware caddy. You can also wash your toothbrush holder at the same time. These often are traps for calcium buildup, bacteria build up and mold! Ewww! If you can, unscrew your shower head and stick it into the washer. 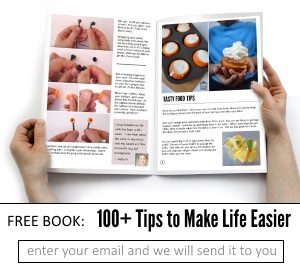 You can also do the same with the stoppers in your sinks! Trust me, you want to wash them. Pipes are places that mold grows uninhibited. It is nearly impossible to get rid of all the mold with conventional “pour down the drain” cleaners. If you suffer from allergies to molds consider dismantling your bathroom sink (not the kitchen one – your dishwasher empties into it) put the pipe pieces into the wash. When they come out the pipe “goo” will be gone. This is a weird one. Honestly, I am scared to try it, but according to this site, and this one, and even this one – you can wash root veggies in a light not heated cycle, or even steam cook veggies and or fish – all in the dishwasher. If you try it let me know. 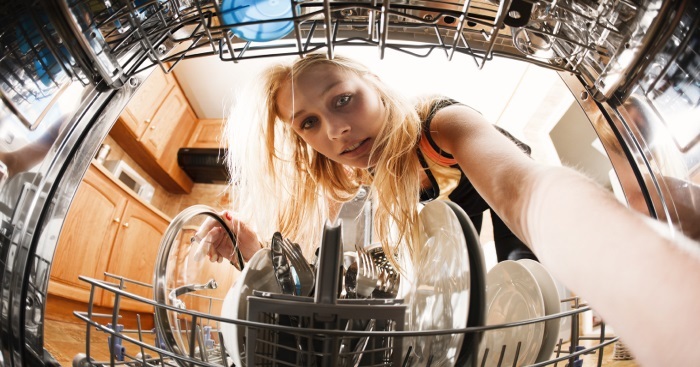 Are you ready to deep clean your house, with the help of your dish washer?? If your machine is dirty come back and let us know!